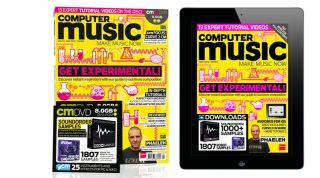 Computer Music issue 189, April 2013 - Get Experimental! • Discover instant inspiration with our massive guide to out-there composition! Take your music to fantastic new places by exploring experimental melodies, chords, scales, rhythms, arrangements and more. • 1000+ Soundorder.com samples- A massive 2.3GB of pro hits, loops, patches, MIDI files and more for all electronic styles! • Rise of the Robots: Cyborg voices, twisted FX, electro beats, synth multis and more!